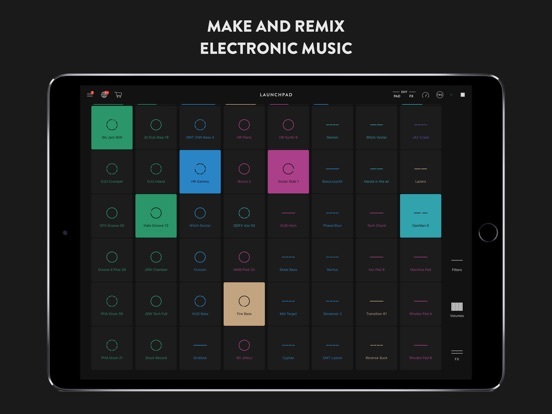 Novation Launchpad got a major update today with a complete redesign of the interface. Even the icon is new! The update also includes 3 free soundpacks, and a new IAP bundle that lets you unlock all of the Pro Features in a collection for $15. The original Launchpad — All-new design, available now. Free update. We’re proud to announce a huge update to Launchpad. We’ve been working hard to redesign the app and make it even more beautiful, easy to use and powerful on new iPhones and iPads. • All-new design — Slick new interface. Crisp and responsive on all new iPhones and iPads. We appreciate your feedback. If you have comments, questions or feature requests, let us know at support@ampifymusic.com or ampifymusic.com/survey. If you like Launchpad and have a minute to spare, please review it in the app store. The Novation video production team continues to justify their employment with well-shot flashy promos! Not sure I think it looks better. I like the separation between pads in the old one. You can still see the names of the pads, right? When I'm working with new sound packs and my samples sometimes it's convenient to see "Bass" or "Melodic" to remind me what a pad is, in addition to the color. I appreciate novation working on this app so much. The feature I want most is a simple clock option. I make videos for sports highlights and I need each to be a set length so I use a stopwatch next to my ipad pro when running this app. Way old school. An optional visible timer or clock function would be great! I meant I make the music for highlight videos on Novatiion apps and presently use a 1990s stopwatch from Radio Shack to keep track of song length. Though full of clichés, that video is actually quite effective. Certainly better than that demo ROLI did for their saxophone soundpack. This one got me daydreaming a bit, maybe because it looked almost Canadian. Still not getting caught up in Focusrite’s Reality Distortion Field to buy any of their hardware, but it did help my mind wander a bit. The app itself remains fun. As per Claude’s question, the pad names are still visible on iPad but not on iPhone (at least, not by default; can’t find a setting to bring them back). But, after all, pads on Novation hardware don’t have names so the idea is probably to learn by doing and hope you can remember which growly bass is on which pad. LOL... I have a great fondness for video production and editing. It never developed into a passion. And never developed into a career, because it always seemed like a pretty insecure career at that. You might get some freelance work sporadically. But whom besides TV studios needs to keep editors and motion graphics guys on staff? Say what you will about Fox News, but they have kept a team of motion graphics artists gainfully employed; making increasingly alarming graphics to scare the elderly. I can see how you'd think I was being sarcastic, but I'm not! I'm genuinely glad that their team is able to justify their continued employment! Caution - this upgrade has some problems with crashing. Novation has promised an upgrade ASAP. I think the problem has to do with importing from Blocs...? Color me grouchy, but this kind of thing just makes me feel sad. It's the music educator part of me, really. I don't have a problem with the resulting music, it's boring, but well-mixed. What saddens me is that MANY people could create those loops and sounds themselves and it would be more satisfying than simply standing around and pressing a button that makes it go. Now if someone made the case that this is a new way to enjoy music in a less passive way, that's one thing. As for using this to make sports highlights music, it seems like the perfect app for that. Imagine if someone released an album that is in Launchpad format. Listeners can mix & match and no two listeners would have the same experience. Is there a companion app that could help a user produce matching elements to load onto those buttons or does it simply flip over to user samples with no sync guidance?